Quickly tidy up bushes, shape hedges and cut lawn edges with these Trimming Shears from Garden Gear. 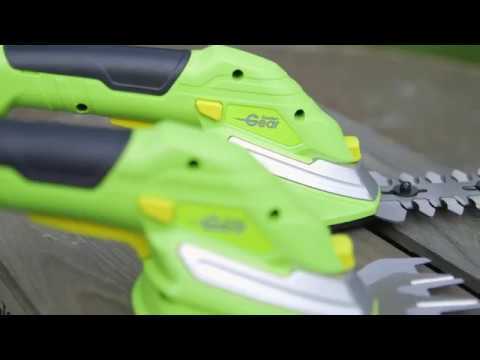 Powered by a lithium-ion battery, the amazing 7.2V Hedge and Edge Trimming Shears provide complete cordless freedom, so there is no need to worry about staying close to a power source or getting tangled up in cords. The shears come complete with two interchangeable blades, a grass cutter and shrub shears. The grass cutter will make light work of lawn edges and has a 90mm cutting width. The shrub shears are great for trimming bushes and shaping hedges, they have a 135mm cutting width and can cut shrubs up to 8mm in diameter. The shears come complete with an installed lithium-ion battery, a charger and two blade guards to ensure safety. Also available is a handle and wheel set that allows you to trim grass edges without stooping or bending.